A grey pottery incense burner, the cup-shaped basin supported on a knobbed, hollow stem, which itself rests on a dish with everted rim. The conical openwork cover is modelled as a range of overlapping mountain peaks, interspersed with a number of small cavities. 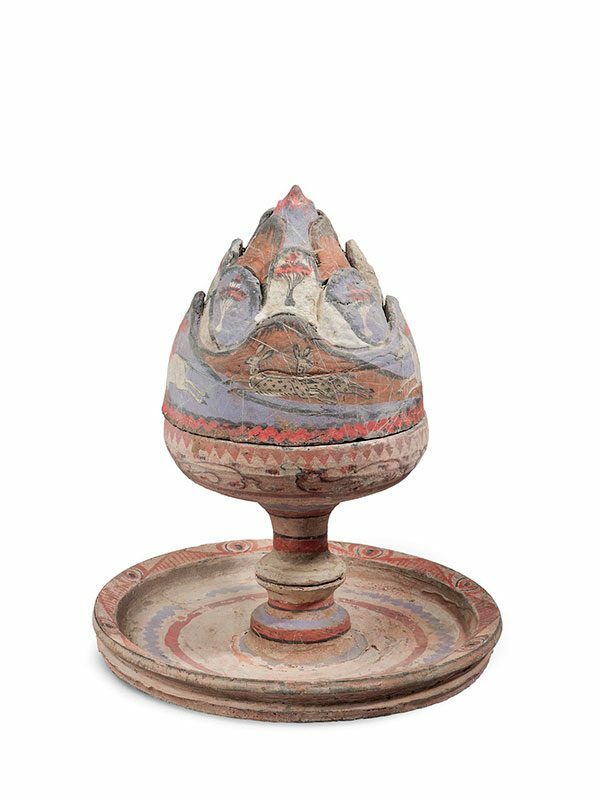 The incense burner is covered in a layer of thin white slip and painted in great detail with purple, red, black and orange pigments. The cover depicts two hunters on horseback, chasing at full stretch a wild boar and two deer, one of which turns its head around to glance back at the hunter. Each mountain peak is painted with a single tree. The basin and dish-shaped stand are decorated with bands of formal and geometric pattern. The boshanlu, meaning ‘mountain censer’, was popular during the Western Han dynasty as a representation of the idyllic, mountainous realm of the Immortals, but does not seem to have existed prior to that period. Han dynasty pottery shapes usually have parallels in metal; a particularly sumptuous prototype for this pottery incense burner, inlaid in gold, is in the Hebei Provincial Museum. Examples of similar shape in both glazed and unglazed pottery are relatively common, but this boshanlu is extremely unusual for its well-retained, vividly bright colour painting scheme and the life-like depiction of a hunt. An unglazed boshanlu moulded with hunting scenes in high relief, dated to the Han dynasty, is in the Julius Eberhardt collection in Vienna. Two green-glazed examples with comparable hunting scenes, dated later to the Eastern Han dynasty, 1st or 2nd century AD, are in the Meiyintang collection. A Western Han brick relief depicting hunting scenes in mountains, similarly including hunters on horseback chasing boars and deer, was unearthed at Luoyang, Henan province. 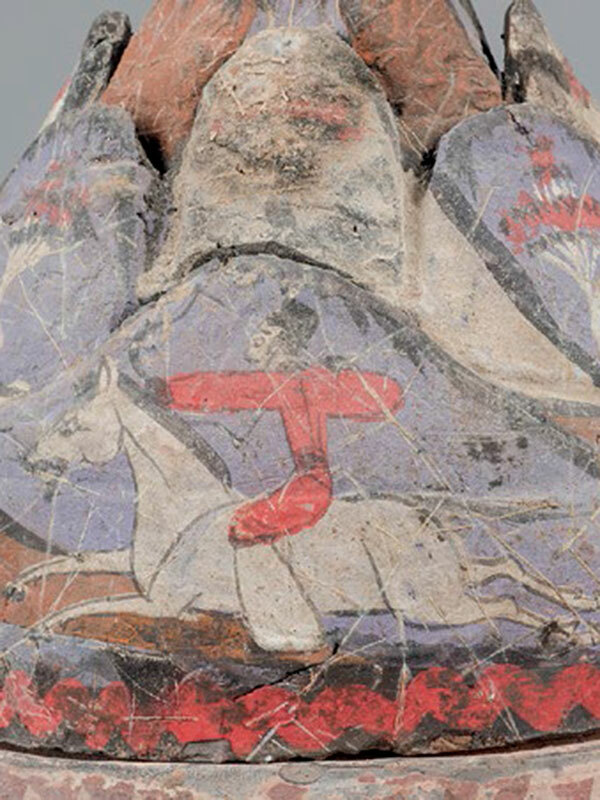 A large Western Han pottery jar painted with a mounted archer chasing a tiger is in the Meiyintang collection.